GST rates for restaurants has been a hot topic over the last few months. The government is of the opinion that restaurants have not passed on GST benefits to customers and have used GST to increase their profits. Here is a quick summary of who will gain and who will lose. 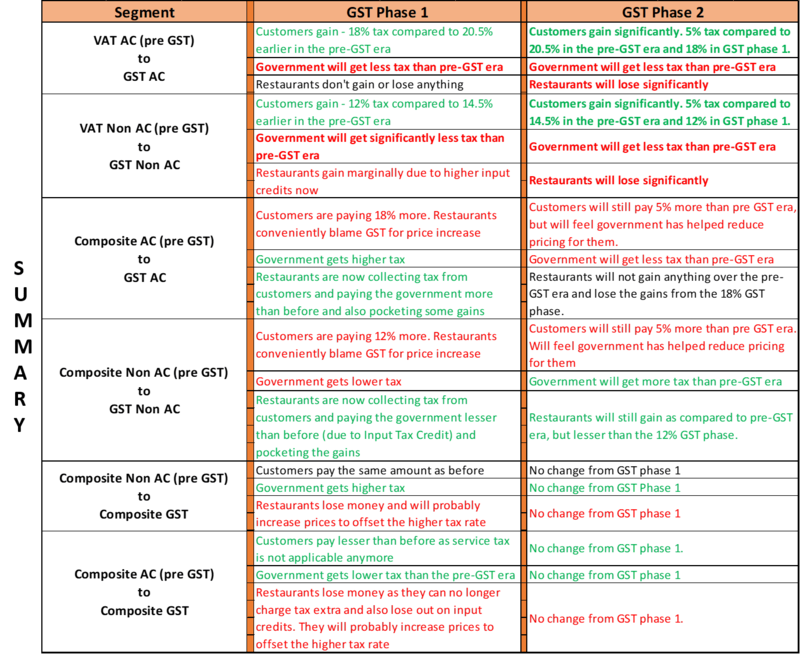 Detailed analysis is provided below. 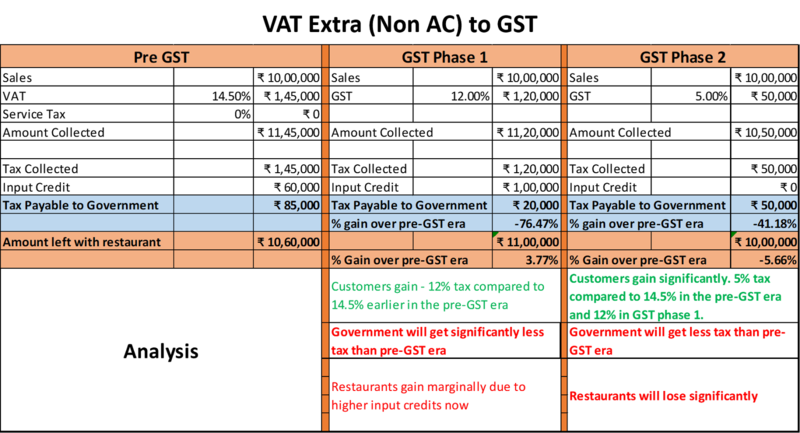 Prior to GST, restaurants were subject to VAT and Service Tax and they were able to adopt a model of their choice. 2) VAT Extra model: Restaurants could opt for this and charge customer 14.5% VAT extra on the bill. They could also claim input credit for all purchases where VAT was charged. 3) Service Tax: For all AC restaurants, irrespective of which VAT model they were on, service tax was applicable. This was 6% of the bill value and could be charged extra. Input credit was also allowed for this. This was applicable only for dine-in and not for takeaway and delivery (though there was some confusion around this). 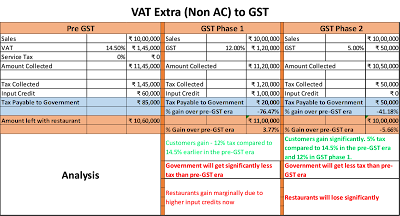 1) Composite GST: All restaurants with annual turnover less than 75 lakhs could opt for the composite model (whether AC or non AC). GST was payable at 5% and this amount cannot be charged to customers on the bill. i.e. 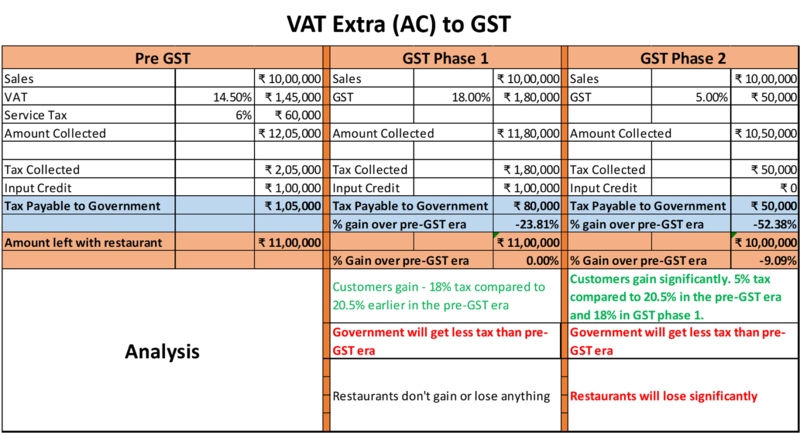 The model was similar to the composite VAT model above and effectively, the rate was pegged at a uniform 5% pan India. 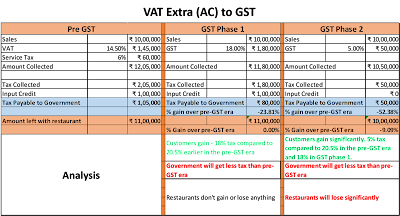 2) GST Extra model: In this model, restaurants could charge GST to customers on the bill. The percentage was 12% for non-AC restaurants and 18% for AC restaurants and was applicable uniformly across all sales channels – Dine-in, Takeaway and Delivery. 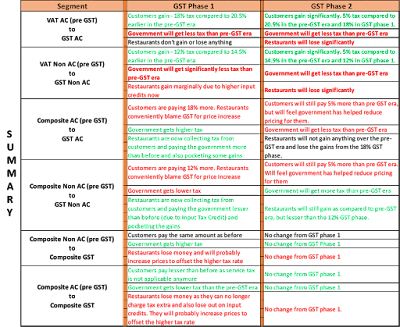 1) The government felt that restaurants were pocketing the gains from GST and were conveniently telling customers they need to pay extra (12%/18%) now because of GST and in some ways blaming the government for the price increase. 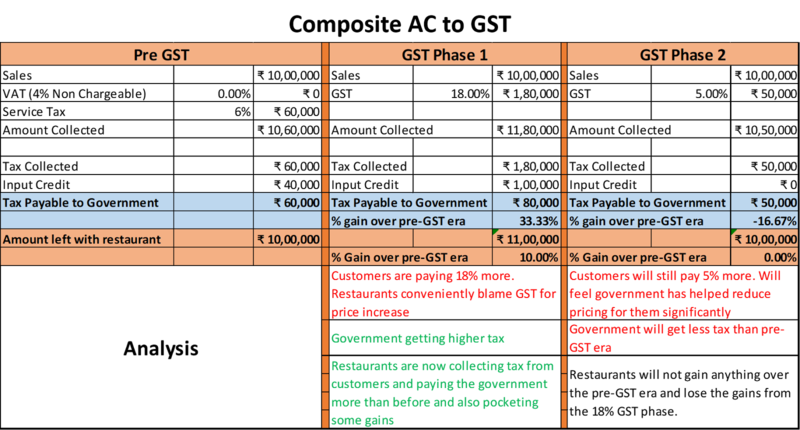 2) The government was even more irked because the tax being collected by the government was now lesser than before. 3) This “Customer pays more, Government gets less and the restaurants gain” situation did not sit well with the government prompting them to make changes and perhaps teach the restaurant industry a lesson. 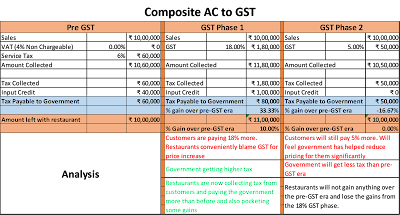 1) In a reactive mode, the government made a decision to lower the GST to 5% across all restaurants and disallow input credit. 2) This change is more a populist move to appease the larger population that the government has taken steps to lower expenses for them. 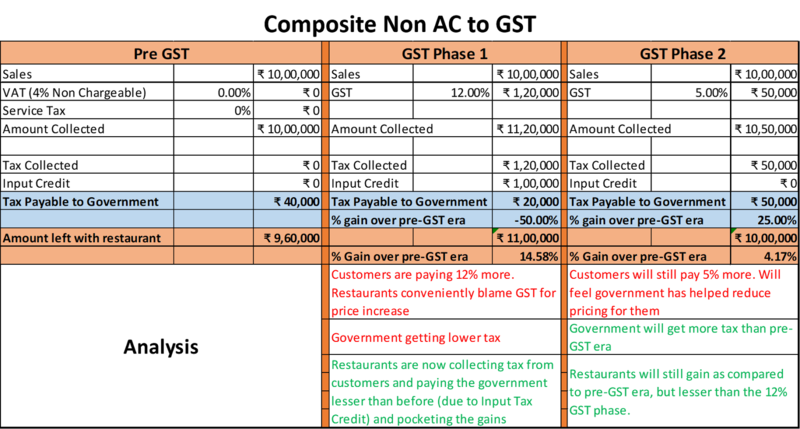 By increasing taxes to 12%/18% initially and lowering it to 5% now, it will seem that the government is helping the common man. The common man will still be shelling out 5% more than the pre-GST era for their regular dosas, rotis and meals. 3) The folks most impacted by this move to disallow input credit are the professional restaurant chains who were on the VAT extra model (14.5% VAT chargeable extra to customers in their bills) and the ones who pay their taxes honestly. Now these restaurants would be able to charge only 5% extra to customers and not get input credit. They will have no choice but to increase prices by about 10% to offset the losses and maintain their net margins. My previous post analyses the decision and long term impact for the industry. 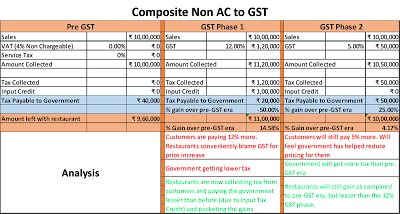 I have provided below the various scenarios for restaurants in the pre-GST era, in GST phase 1 and now in GST phase 2. Hey Very Nice Blog !!! Thanks For Sharing !!! Thanks for sharing the info with us. We are the chief merchant of Hotel crockery importers in India. We offer a wide range for all hotel products under one roof only. We are leading Metal items for Restaurant Service. The GST for travel industry and hotels are coming with its share of adverse impacts. GST is also hit the inflow of foreign tourists to India. Thanks for the useful information in this article. Willing to viist ranchi. Try the best restaurant in Ranchi here. Must visit the restaurant..
ManageTeamz restaurant delivery management system helps to speed up your restaurant delivery business with advanced features like automate delivery dispatch, real time delivery driver tracking, proof of delivery and more. Try now.! This is amazing! Informative and complete in details. Thank you‚ Will definitely bookmark this. Landmarkpallavaa - Best Family Luxury Beach Resorts in ECR with the facility of swimming pool, indoor games and secured online booking, call 8939944400! Thank you for sharing information. this post is very useful. Its really helpful for me, waiting for a more new post. Keep Blogging! Hotel Purohit Lodge one of the best budget hotels near Har ki Pauri in haridwar.It takes pride in offering its guests a peaceful and tranquil heaven. While surfing internet, I landed on your blog and it seems to be very informative. Keep up the good work. Hotel Purohit lodge one of the best budget hotels in haridwar takes pride in offering its guests a peaceful and tranquil heaven. The perfect retreat for visitors and business travelers alike. Hotel Purohit lodge has been completely transformed into a luxury hotel providing discrete accommodation with sumptuous comfort and vide variety of Indian and Continental Food. Thanks for one marvelous posting! I enjoyed reading it; you are a great author. I want to encourage that you continue your great post about franchise opportunities in japan, have a nice weekend! Getting Jobs in Mumbai has become so easier with the leading job portal Theincircle.com. You can apply for various job opportunities in every industry. We don't charge from our candidates. We provide placements in many sectors. Great info on GST rates for restaurants. brick lane curry We are a high quality Indian restaurant that delivers a great experience and great customer service. We are based in Brick Lane, serving to the general public. Our reputation is very important to us and that is why we are happy to have such a prestigious one.